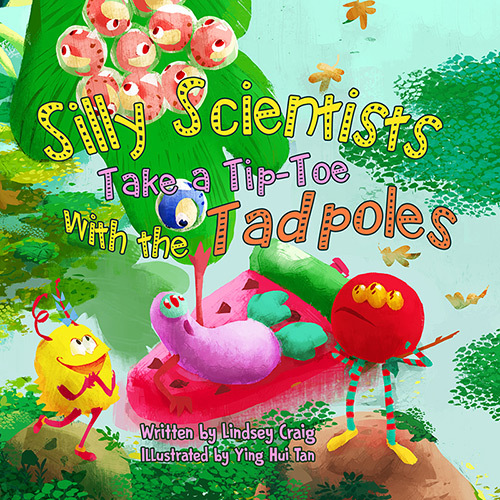 Silly Scientists Take a Tiptoe With The Tadpoles! is all about science fun! Here kids meet the adorable monsters—Zap, Tia, Sulu and Alan and dive into the murky pond to save Thadley—the Tadpole. Along with the story is the rhyming science text about tadpoles. Tadpoles make big changes called metamorphosis. They grow long legs, and big bug eyes, and smiles you can’t resist! Teachers and parents will find a glossary in the back of the book, as well as, fun science articles, crafts, and free music downloads for all of the Silly Scientists Series at the author’s website. Silly Scientists Take A Tiptoe With The Tadpoles! makes science fun for everyone!